I am an Equine Gestalt Coach, partnering with my horses to serve young and old alike to live from their authentic selves and live the life they desire. April 13, 2009 – August 29th 2018. The Princess Murren, also affectionately known as Sugar Plum, Plum, Plummie, and my baby girl. It is with great sadness I bring you the news of the passing my sweet girl. Murren. This big beautiful girl never left my side. Her soulful gaze was always upon me. She lived a life of service, to me of course, and oh so many. Starting with the boys at Gray Wolf Ranch, who were away from their homes, and animals for 5 months or more. They lite up with delight when Murren came bounding into meditation each morning. She would check in with each boy individually. The boys would lay on the floor with her as they played Battleship and other games. She often accompanied them on hikes and other journeys. She taught them patience, calmness and trust. We also started Read to Rover at the Quilcene School. Children that would not read in the classroom would read to the dogs. They felt very special and loved by all the dogs. But if they had their choice, would all line up in Murren’s line to read to her. 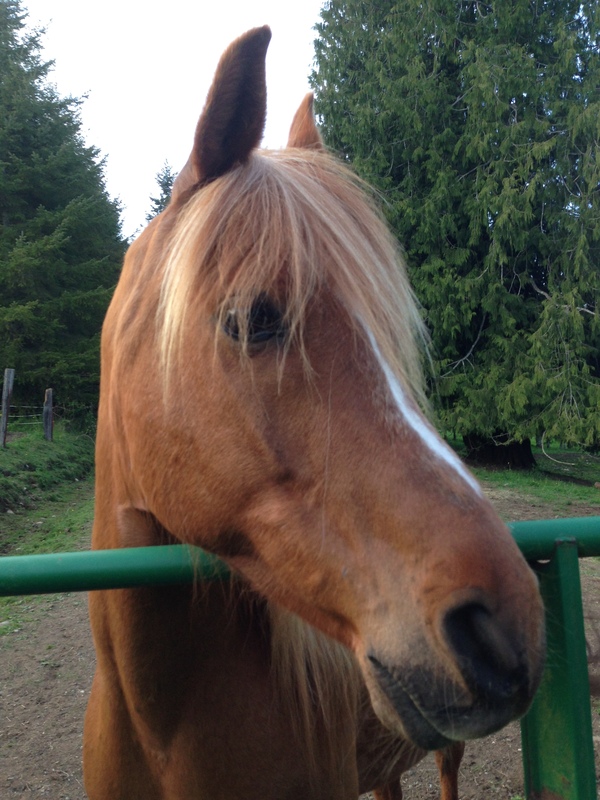 She also worked on the healing team at Empowerment through Equus. She was a welcome greeter to all and was always nearby holding space; giving lots of love and grounded energy. To show affection Murren would lean on you, sit on your feet, or present her paw. She did know how to ask for affection too… presenting her hips for a good rub. She was known to be a proper girl crossing her front paws, a true lady. Murren enjoyed coming on trail rides and could keep up with the best of them, whether it be in the mountains of Montana or the logging roads up Snow Creek. She is a sweet beautiful spirit, loved by all. Everywhere we went she brought a smile to people. She was everybody’s therapy dog. And of course on FB, many know “Where’s Murren” She has captured the hearts of many, bringing lightness and love to all. She has crossed the rainbow bridge, leaving a huge gap, in the physical realm. I miss her huge presence and her sweet loving gaze. But she is still with me and all of us in spirit. Her happy good natured spirit lives on. Thank you sweet girl for your never ending love and devotion and a true life of service. Your mom, I’ll love you always. so much to appreciate in life. a new grandson named lincoln. almost 3 months and happy and healthy. a new title, grandma lee 🙂 riding itchy twh in the mountains in the seven mile valley in mt. time with friends, swimming, riding, sleeping under the stars! new friends, old friends, 4 legged friends, hiking in the mountains, staying in neat cabins, road trips in truck and riding the harley. 4 legged neighbors, clients from around the world, playing canasta with friends, visiting lincoln, kristen, aaron, lorinda, mom, and others. meeting folks along the way. evening rides, fresh grass hay, beautiful days, beautiful nights, learning and growing, safe travels, and more to come! What’s on your gratitude list for this summer and fall? There you are, I don’t have to pray, I don’t need to see, you accept me as I am. You love me merely because I exist. For two hours you have my heart and I feel my soul, through your eyes. You are more than a horse, for you are my SWEET.